I’ve been using iOS 11 betas for a while now and one of the apps that I’m really impressed with is Maps. I don’t know why, but I use mapping apps a lot to test them out—it’s a strange habit that I developed years ago and I still do it today. I mentioned before that Apple Maps was good, but not great. When I went to a city or place that I wasn’t familiar with—the time when you need solid directions the most—I couldn’t use Maps because it didn’t have lane guidance. In case you don’t know, lane guidance is a feature that tells you which traffic lane you need to be in to make your next turn. For instance, if you are taking an exit ramp, Maps will tell you to be in the right two lanes. Lane guidance may not sound like a huge feature, but when you’re cruising down a 5-lane highway in Los Angeles and you need to cross over four lanes to the right for your exit, you appreciate it. Any time I travelled, I would use Google Maps because of its detailed instructions, not just about where I was going, but exactly how I was going to get there. 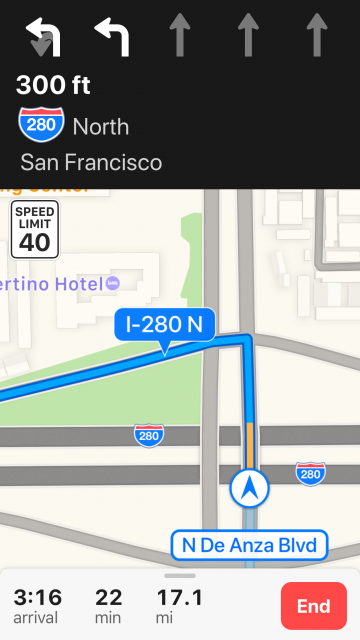 Apple Maps now has lane guidance in iOS 11 and it works perfectly. I haven’t taken a trip to LA since I’ve been using it, but I have gone to a couple of places I hadn’t been before and it worked just as I expected. Maps now also shows you what turn is coming up next. For example, on the top of the mapping screen it will show that you need to make a left hand turn—directly under that, it will show you that your next turn is a right. This helps you determine which lane you should be in. Maps is also getting better at finding alternate routes to your destination. It doesn’t just do it when you ask for directions, it continues to do it throughout your trip. Every once in a while I’ll see a “Similar ETA” label flash up as I’m coming close to a road. Maps is telling me that I can turn there and it’s already determined that it will take about the same amount of time as the route I’m currently on. These are all great features that makes using Maps a better experience. There is certainly a lot to like about iOS 11, but Maps is by far the most improved Apple app for me.